Braces straighten teeth by putting steady pressure on your teeth and by staying in place for a certain amount of time. The wires on your braces actually move your teeth, while the braces serve as "handles" to manipulate your teeth. 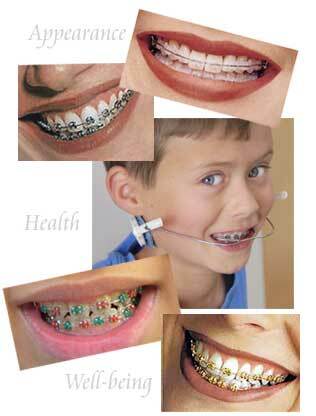 Everyone has to wear braces for different lengths of time, but most people usually wear braces for about 1-3 years. You'll also want to take special care of your teeth after the braces come off. You may need to wear retainers, which are small, hard pieces of plastic shaped like a mouth guard. Your retainer will be specially molded to fit your newly straightened teeth. After you get your retainer, we will tell you when you have to wear it and how long — typical wear is 12 hours daily after removal of orthodontic appliances. Braces are magnets for food, so you need to keep your teeth especially clean while you have them on. You'll want to brush after meals and be extra careful to get out any food that gets stuck in your braces. We give all of our patients a special flosser which is used to floss in and around the braces. We give patients the chance to floss and brush without wires at each appointment. You won't have to go on any special diet when you have braces, but you'll want to avoid some foods that are problems for braces. Stay away from hard, sticky, sugary foods, and especially gum. Sugary sodas and juices can cause problems, too, because the sugar stays on your teeth and may cause tooth decay. You can have these drinks, but be sure to brush afterward. Because braces put pressure on your teeth, you might feel uncomfortable once in a while, especially after we make adjustments. If you have pain, ask your mom or dad to give you a pain reliever. If you ever have a loose wire or bracket, or a wire that is poking you, you should contact us right away to get it taken care of.